This is the moment it all begins. The awards season (if we have to give this time of year a label) starts now, right here at the end of August, at the beginning of September. While officially it doesn't become "autumn" until September 22nd, the "fall film festivals" kick off this week - with the Venice and Telluride Film Festivals underway. Next we head right up to the Toronto Film Festival, with its 300-film line-up, and then we head to the always entertaining Fantastic Fest down in Austin, before continuing with the New York Film Festival throughout October. It's an exciting time of year - especially with the line-up for 2014. Every time I start writing about the awards season, I usually get to a point where I want to say: you know… just go read Awards Daily and what Sasha writes, she captures the feeling of this time so much better. In her blog post titled "A Brief Recent History Telluride and How It's Become So Influential in the Oscar Race" about the Telluride Film Festival's history, she eloquently sums up my own excitement as we head into the fall festival season. And, admittedly, I can't put it any better so it's better to just repost what she's written. Two weeks from today the Telluride Film Festival begins. It is an exciting time of the year because this festival, more than any other, heralds the arrival of the Oscar race. In the years I’ve been attending Telluride, the Best Picture winner has screened there, either premiering or part of the schedule. The last two Best Picture winners debuted there, with their directors bringing the films along to showcase, 12 Years a Slave and Argo. The Artist was the film everyone was talking about in 2011. Tomorrow I depart for Telluride, my 7th time back to that fest. Very, very few press attend Telluride - it's expensive, it's hard to get to, and there are no press passes so everyone has to buy a badge. No problem for me, it's worth every last penny, even for a quick weekend - I wouldn't miss it, I couldn't miss it. Over the years I've come to love Telluride because the atmosphere at the festival is incomparable, and they keep the line-up a secret. It's frustrating for those on the outside, but I trust they'll choose great films in the end… for the most part. They always have something I just have to see, that always makes it worth it. Right after that I'll make my 8th trip to TIFF, and my 5th visit to Fantastic Fest. Bring on the festivals. Bring on the films. Over the many years I've been covering film festivals, and the awards season, I've learned that it's best not to over hype, to go in with limited expectations and find whatever leaves us in awe. That could be some film we had no idea was coming up, or that could be the one we're all expecting to be amazing (PTA's new film? Birdman?). But only time (and a screening) will tell if it's actually any good. Which is what I'm most excited about - queuing up, entering the theater, the lights going down, then it's time… Time to find out if this film will change the world forever, or leave us bewildered, or bore us to sleep. Ya, we always see a few of those. Eden - Directed by Mia Hansen-Løve - From the French director of Father of My Children & Goodbye First Love comes this story set during the 90s when electronic dance music was taking over Europe. Follows the life of the French DJ credited with inventing "French house", played by Félix de Givry. 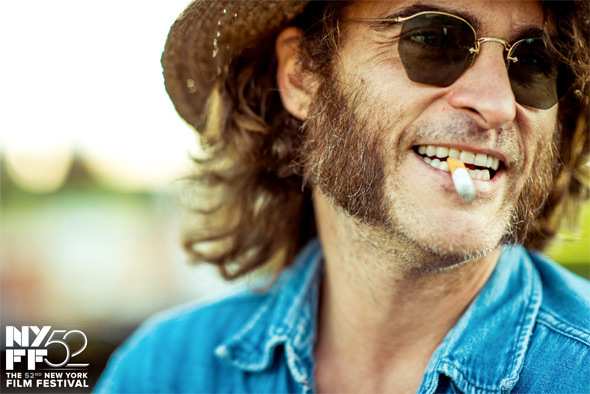 Inherent Vice - Directed by Paul Thomas Anderson - Adaptation of the Thomas Pynchon novel starring Joaquin Phoenix as stoner private detective Doc Sportello in 1970's Los Angeles, who gets wrapped up in investigating the disappearance of a former girlfriend. This should be tons and tons of fun. Rosewater - Directed by Jon Stewart - The Daily Show host Jon Stewart's feature directing debut about Iranian journalist/satirist Maziar Bahari, played by Gael García Bernal, who was detained and tortured in prison for 100 days after trying to film and cover the 2009 election protests. The Look of Silence - Directed by Joshua Oppenheimer - The follow-up from Oppenheimer and the Oscar-nominated The Act of Killing, another documentary from Indonesia about a family that survived the genocide confronting the men who killed one of their brothers. Manglehorn - Directed by David Gordon Green - The latest from eccentric filmmaker David Gordon Green starring Al Pacino as a locksmith in a small town in Texas who never got over the love of his life. While We're Young - Directed by Noah Baumbach - The latest from NY-based Baumbach, about an uptight documentary filmmaker and his wife who find their lives loosened up a bit after befriending a free-spirited younger couple. Starring Ben Stiller & Naomi Watts, with Adam Driver & Amanda Seyfried as the younger couple. The Cobbler - Directed by Thomas McCarthy - Starring Adam Sandler as a lonely New York City shoe repairman who stumbles upon a magical heirloom that allows him to step into the lives of his customers and see the world in a new way. This sounds trippy - think Being John Malkovich. 99 Homes - Directed by Ramin Bahrani - The latest from talented filmmaker Ramin Bahrani starring Andrew Garfield & Michael Shannon as a family that struggles to get back the home they were evicted from by working for the greedy real estate broker who's the source of their frustrations. Blind - Directed by Eskil Vogt - A brilliant, original Swedish film about a gorgeous woman going blind and her experiences (physically, sexually) that become increasingly surreal. A very beautifully made film. From here it's just a matter of finding out what's good, what's bad, what's amazing, what's horrible, what's transcendent, what's disastrous. I'm always anxious to get into the fall festivals because there are so, so, so many good films coming up. Sight unseen, I can guarantee they're going to be good, there's going to be at least one (or hopefully five or ten) films that blow us away. More of those, please. Last year we had Spike Jonze's Her, Steve McQueen's 12 Years a Slave, and Alfonso Cuaron's Gravity leading the awards season. What will be the best of the bunch in 2014? Which films will everyone be talking about? Or better yet, which films will no one be talking about that they should be talking about? How many of those will we discover? Let's find out together. That's why I'm here, to report back on the films that I love (or don't love), to start a discussion, to cinematic encourage exploration and discovery. So that all of us, everyone who loves movies big or small, can enjoy the kind of movies that make our lives better. I'm honestly not here to crticize and bash films and nitpick them, I'm here to fall in love with them. So that we can all be reminded, day in and day out, as tough as life if there is something to enjoy or appreciate or admire or despise or inspire or love. And that is worth living for – the endless search for those little moments that make our hearts beat faster. Birdman, Gone Girl, Nightcrawler and Foxcatcher are the ones I'm most interested in. I'll be seeing Nightcrawler, and I just found out Foxcatcher will be at TIFF, so I'll probably see that too. Can't wait! BRING IT! FALL/WINTER is the season for REAL movies. So excited to see how all the coverage from FirstShowing. You Da Man AB!!! What a great list. Look forward to hear what gems, dark horses, and performances come out of this.